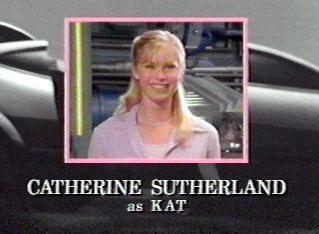 Kat, the Pink Turbo Ranger, a native Australian, is a natural born leader. She is sophisticated and aggresively takes control of any situation. She is interested in helping her community and the environment, with an Austrailian belief that the land is sacred. Her formal training in dance gives her a graceful and fluid fighting style. Kat is a student teacher at Justin's school, and discovers that he is a child genius. As the Pink Turbo Ranger, Kat pilots the Wind Chaser Turbo Zord, and arms herself with the Turbo Wind Fire. Kat passed her Turbo powers on to new Pink Ranger Cassie.